Is the art of face reading only for the Chinese? 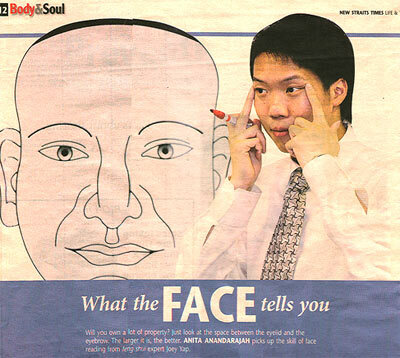 “As long as you have a face, you can read another’s fortune,” is feng shui practitioner Joey Yap’s standard reply. At the face-reading workshop last month organized by the Mastery Academy of Chinese Metaphysics of which Yap is the founder and CEO, an estimated 95 per cent of the 1,500 attendees were Chinese. The rest were Indians and Malays. The popular misconception is that face reading, feng shui, Chinese astrology and religion are one and the same. “These have nothing to do with religion. The three disciplines are part of Chinese metaphysics. “Just come and listen to the principles,” said Yap during the first-ever large-scale talk on face reading organized. Now that’s a sales pitch. “I meet all sorts of people in my field. I hope to learn the Chinese method of understanding human behavior,” said Dega. During the workshop, Yap spoke of the 12 “palaces” on the face. One of these palaces is the Property palace demarcated by the area between the eyelid and eyebrow (the other palaces are Traveling, Parents, Career, Fortune, Virtue, Marriage, Life, Children, Health, Wealth and Hired Help). The Property Palace can tell us whether a person has the ability to amass sizeable property during his lifetime. The larger the area, the sooner that individual will achieve success. Telecommunications executive Marsella Abdullah is acutely aware that Chinese metaphysics, let alone face reading, has no link to religion. She and her friend Izaedahwati Mohd Isa enjoyed Yap’s feng shui workshop held earlier this year so much that they decided to give face reading a go. “It’s a great way to study people at face value. Who knows, the knowledge would come in handy when dealing with partners and relationships!” said a bubbly Marsella. There are those who believe face reading and feng shui are hogwash. “How can a person’s face determine his future? “It’s God’s will and not something that can be read off my face,” said one attendee who was spotted leaving midway through the workshop. Yap had mentioned in a previous interview that he employs a more scientific approach when delivering lectures abroad as his European audience is more questioning. Yap’s brand of feng shui, which he terms “classical feng shui”, has attracted attention in recent months thanks to his appearance on 8TV every Sunday at 11pm. The art of face reading, which is also taught at his academy, is fast gaining interest. More importantly, people are taking notice of his fresh approach which denounces the need to purchase ornamental objects to be placed in a room to aid the practice of feng shui. His office in the Mid Valley Boulevard in Kuala Lumpur is devoid of brass toads and crystal balls. What you will find is a copy of his book The Ten Thousand Year Calendar on his desk alongside a computer notebook and a PDA phone. “I want people to know that different practices exist. Being ‘western educated’, I wanted to be exposed to different methods,” he said.